File pro-se,self file and take back your right,when doing so. U.S.C.A.Title 42;Section 1983 is your remedy if your being violated by child protection services,per violation,seek such redress,in the District Federal Court,before your time indeed,SHALL RUN OUT to sue DYFS.Fill out contact/help page below to begin. OFFICIAL FACEBOOK TO SUE BY DEADLINE CPS. DYFS shall not violate a happy home.Not without such suit filed timely for a violation of a well-established,constitutional right,without imminent danger to the child and or exigent circumstance,as case law wholly support. 1-855-806-0007. Just this year... 2012,also during 2014,decision came down allowing another loving GRANDPARENT in the Mount Laurel,Mt.Holly,to Cumberland County,to Burlington County whose suing abhorrent NJ DCPP,DYFS,DCF worker who was sued premise on grandparent harmed by DYFS misconduct,interfere with the grandparent right to visitation;and or the right to be considered,for custody in NJ in oppose to the danger of foster care,the grandparent,was able to move forward only "After the grandparent through referral was able to find/locate bellas law student clinic,in association with ATTORNEY ALTERNATIVE TO SUE CPS DYFS BY DEADLINE,SUE CPS NETWORK and file pro-se,without a lawyer... Such verified-grandparent who won right to move forward,is publicly-announced,we are happy for him,his daughter,and the daughter partner,No lawyer took the case.We got him there,and they are forever going to remember such team who"care"enough and who were prowess-enough,to see to it he was able to file in time to be considered by a federal court/state court/magistrate.We are happy to be of help when lawyers did not care to help. MORE GRANDPARENTS ARE APPLYING TO THE COURT FOR CUSTODY. (if parent is in litigation to regain custody)and or in a NEW JERSEY FACT FINDING HEARING/TRIAL where a false allegation was lodge,against the parent. Time to take action if this is happening within your own family,before it is too late to do so. Such grandparents are a huge part,of the child upbringing;when such healthy,created bond is established. Children happy,being fed,taken care of,clothed,educated,raised properly by you a loving grandparent,are in an instant,removed? Pro-se self file action,immediately taught here at BellasLawStudentClinic to see to it,your visitation,are again going to become a reality again,as well as able to file your own timely-filed lawsuit against CPS,for such inequities associated with your beloved grandchildren. DYFS,whether in Ocean,Warren,Monmouth,Mt.Holly,to Mt.Laurel,Cherry Hill violation by NJ CHILD PROTECTION SERVICES,to Ocean,Burlington Township violation by DCF, to ATLANTIC CITY DYFS,DCPP DCF,violation to County of Union DCPP violation,DYFS in Newark,NJ,Essex,Somerset,Cumberland,and all 21 counties,throughout New Jersey,violated your U.S.Constitutional Right,involving such custodial right,to per grandchild." 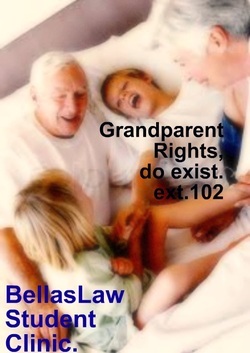 Loving Grandparents,violated by DYFS abhorrent workers, are clearly,learning from the first consult with Bella,what"exactly dyfs can do"and what the caseworkers are NOT by law allowed to do,when it come to your rights,when lawyer do not care to proceed to take ACTION ,and not just your"typical every day"legal/attorney type of jargon. More grandparents,from all walks of life,call-in weekly and learn "more than they knew prior,and move in due course,to take action by such lawsuit,filed against such person(s)@ DYFS/CPS violating their right." Your beloved grandchildren,are always bringing joy,to your life,but yet a caseworker,attempt to undermine,is evident,protect yourself. Your grandchildren,today,and one's future by filing your intent to sue,followed by your lawsuit for such damages in the U.S.District Fed.Ct.before your time,run out to sue,when your clearly being violated,your rights are being infringe upon by cps dyfs. ext. 102. 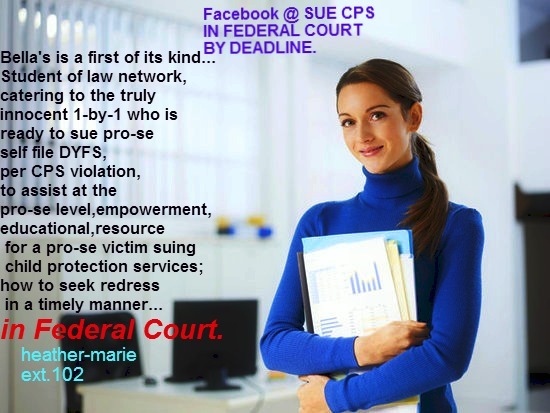 Be sure to call today,begin on your suit against horrid child protection services,known as PRO-SE SELF FILE,if no lawyer you are consulting with has cared enough to file,and be sure to first,prior to calling our VERY BUSY org.biz,to simply scroll down below. THE ONLY STUDENT OF LAW,PRO-SE ACTIONABLE CLAIM CENTER WORLDWIDE. inequitiesand lawsuit timely filed pro-se(self file)involving damages,involving wrongful removal of your sweet child/grandchild. Fill out below,all appropriate spaces,Thank you. The SUE CPS PRO-SE SELF FILE CLAIMANT,Resource Ctr.is now able to help those,avoid DYFS inequities,and or the continued,reckless disregard by per worker employed by ahorrent DYFS and CPS nationwide,when it come to what is most relevant to you,and that is your GRANDCHILD, your child. ext. 102. A unique,microcosm of aggressive; Law Students:Legal Assistant training;13yrs.expertise in such inequities,associated with child protection services,procedural;mandate; that protect you,the loving GRANDPARENT from being continually and so needlessly by DYFS,DCPP,CPS.When lawyer(s)is not timely,placing caseworker on such timely-notice,file pro-se,self file before YOUR TIME indeed,if waiting too long,shall run out from ever being allowed to sue, CPS. TAKE ACTION AGGRESSIVE,NEW BRAND OF 21st Century TRAINED-Advocate(s)student of law ctr. pro-se(self file)when your own attorney,has not done ANYTHING,pursuant to such recourse that is available. When those researching the nation's very first,well-respected student of law network,they "feel"a sense of relief,knowing that finally "someone truly cares"and have taken such prequisite;timely action,to see to it CPS worker(s)when violating a parent/grandparent right,is to be held accountable before deadline bar one from doing so . 1-855-602-5557 ext. 102. Such founder Ms.Melendez did exactly that,now is moving toward,the procurement of her Juris Doctor,"JD"to 1 day represent all of those who are"truly innocent but yet are being forgotten about,and or IGNORED,overlooked,importantly GRANDPARENTS. Before your time run-out to hold CPS accountable,once and for all,in the U.S.DistrictFed.Ct. BEFORE DEADLINE.